What2Share, available for iPhone and iPad through the Apple iTunes App Store, may seem like a standard, if decent customisable iOS keyboard at first glance. However, like so many apps these days, taking a second look will reveal some really cool social features that will make this one of the most innovative keyboard replacements on the market, and one that social network addicts should be using as their number one choice. First of all, the app is free, but requires a couple of extra steps to use. Once downloaded, go to your settings app, then to ‘general’ and finally to ‘keyboard’. Once you have selected the What2Share keyboard, you must click on it again to allow full access. When all this is done, you then need to click on the globe icon in your standard keyboard while in an app, then on the ABC icon and you can then use the keyboard as default for that app. It sounds complicated, but it all takes seconds. You are then free to play around with the new keyboard and explore its wide breadth of features. The first thing you will notice is the row of new icons along the bottom of the screen, and it is here where you will be spending most of your time, as there are some really cool new ideas here. For example, you can touch the little icon marked ‘GIF’, and the keyboard will pull down the most popular GIFs from the Internet and display them right there. You can also search the Web for GIFs, or use hashtags to find the ones you want. Once you have found one, you can save it to your camera roll, then add it to your messages or emails. It is a great idea, and fantastically implemented. Yes, I would rather have the step of having to add things to my camera roll removed, but that is a limitation of iOS and not the developer’s fault. 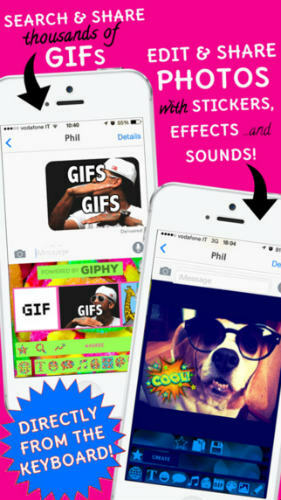 GIFs are not the only things you can find and send with this keyboard. Smileys, balloons, and even screenshot collages can be found and sent with this. You can even create your own custom memes from within the keyboard and send them. In addition to this there is the ability to edit photos and add things to them, and even select and share sounds over the app and draw your own doodles. What this means is that the keyboard ends up being a fantastic partner app to apps like WhatsApp, Facebook and any app that uses a keyboard. Your mates will wonder how on earth you find custom memes and GIFs so quickly and just how you share doodles and screenshot collages within seconds. I do have one criticism however, and that is I feel that too many features are locked behind a pay wall. I would rather there were some kind of trial period where users get to play around with everything for a few days before agreeing to purchase. Yes, at the moment you can look at some of the better features, but you need to pay to use them. I would also like to see a few more of the themes made free. This is a small problem though, and easily solved in the future, and shouldn’t stop you from trying this app out. Overall, this is pretty much an essential app for social network addicts, and will also be great for those who frequent forums and Reddit. With a wealth of great features that will complement your existing suite of social apps perfectly, this is a must download for many users. This article What2Share iPhone Review appeared first on The Smartphone App Review.